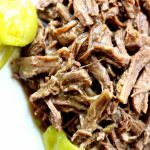 With just a handful of ingredients and an hour in the instant pot you can make the best roast of your life. This particular recipe has no packets of ranch or au jus like the original recipe calls for. The meat is slightly spicy and infused with flavor. This roast is perfect served with mashed potatoes or on a crusty roll as a sandwich. We like to serve this roast as a sandwich on a crusty roll or with mashed potatoes.